"It is good to see that over the years the York Course has not become predictable or stale." An ecumenical course in five sessions written by Canon John Young comprising course booklet, CD and transcript; ideal for Lent, yet not Lent-specific. This raises big questions. Aren’t we all children of God anyway? 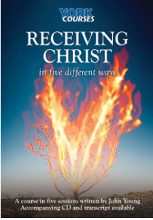 Just how can we receive Christ? And what does it mean to have ‘a relationship with God’? The course booklet includes a good selection of questions at the end of each of the five sessions, designed to stimulate wide-ranging discussion. Each group needs 1 CD, and group members will benefit from having their own personal copy of the course booklet. In addition many groups find the transcript booklet, which sets out the words as spoken on the CD, invaluable. Please arrive at 10.15am for coffee and the course will start at 10.30am. A frugal lunch of soup and bread will start at around 12 midday and all donations this year will go to the Bishop's lent appeal. (See below). Please inform your host if you will be attending and he/she will provide you with directions to the house. We hope to see many of you there for all or some of the sessions. Session One Page 1 of the Course booklet Eric Milner Milner-White OGS CBE DSO (1884-1963) was a Dean of York in the Church of England, holding this post between 1941 and his death in 1963. Prior to this he was the Dean and a Fellow of King's College, Cambridge and during this time at King's College, Milner-White introduced the Service of Nine Lessons and Carols. This was first broadcast in 1928 and has now become a major part of the BBC's Christmas schedule. Its Bidding Prayer features the words: ‘Let us remember before God all those who rejoice with us, but upon another shore and in a greater light’. Session Three Page 14 of the Course booklet The Imitation of Christ (Latin: De Imitatione Christi) by Thomas à Kempis is a Christian devotional book. It was first composed in Latin ca. 1418–1427 and is a handbook for spiritual life arising from the Devotio Moderna movement, of which Kempis was a member. The Imitation is perhaps the most widely read devotional work next to the Bible, and is regarded as a devotional and religious classic. Its popularity was immediate, and it was printed 745 times before 1650. Apart from the Bible, no book has been translated into more languages than the Imitation of Christ. The book places a high level of emphasis on the devotion to the Eucharist as a key element of spiritual life. Session Four Page 16 of the Course booklet Track  on the CD / p. 13 in the Transcript booklet The Light of the World (1851–3) is an allegorical painting by William Holman Hunt representing the figure of Jesus preparing to knock on an overgrown and long unopened door, illustrating Revelation 3.20: "Behold, I stand at the door and knock; if any man hear My voice, and open the door, I will come in to him, and will sup with him, and he with Me". According to Hunt: "I painted the picture with what I thought, unworthy though I was, to be by Divine command, and not simply as a good Subject." The door in the painting has no handle, and can therefore be opened only from the inside, representing "the obstinately shut mind". Hunt, 50 years after painting it, felt he had to explain the symbolism. The original, painted at night in a makeshift hut at Worcester Park Farm in Surrey, is now in a side room off the large chapel at Keble College, Oxford. Toward the end of his life, Hunt painted a life-size version, which was hung in St Paul's Cathedral, London, after a world tour where the picture drew large crowds. Due to Hunt's increasing infirmity, he was assisted in the completion of this version by English painter Edward Robert Hughes. A third, smaller version of the painting is on display at Manchester City Art Gallery, painted by Hunt between 1851 and 1856. 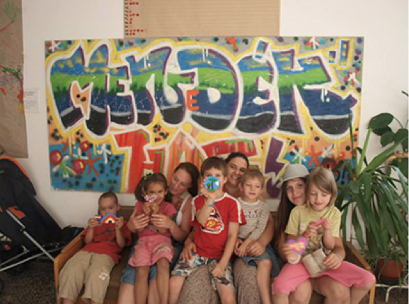 At the Menedékház a professional staff of social workers serves some 160 people, many of whom do not meet the criteria of other established social assistance programmes. Some clients find their way to the shelter from impoverished villages in the countryside. Other clients are residents of Budapest who may have suddenly lost a job or been evicted from housing. Still others make their way to the Menedékház from alternative shelters now abruptly unavailable to them for bureaucratic reasons. The Menedékház is housed in aging Soviet-era military barracks. They provide minimal amenities and little privacy for the families served. It is a roof over the head – sometimes not much more -- a place for families to catch their breath while parents seek employment and children try to continue their schooling during the crisis the family is facing. A significant proportion of clients are of Roma family background. The Menedékház has also from time to time provided shelter to refugees and migrants. Whilst the Menedékház has washrooms and toilets, they are in poor repair and highly communal, offering little privacy or sense of security to families already traumatised.Built decades ago for military recruits, the facilities are today wholly inadequate and run-down, with peeling paint, cracked flooring and tiles, and little ventilation. 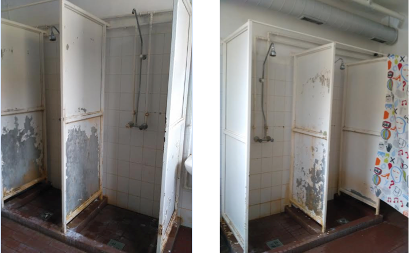 Accordingly, this year’s Lent Appeal Project at the Menedékház in Hungary aims to fund the comprehensive renovation of the family washrooms, providing individual cabins or cubicles for family groups to change, wash, and shower. We estimate the cost of renovation to be in the range of ten to fifteen thousand pounds sterling. The proposed renovation will include…. Sometimes it is the smallest things in life that count the most. With this project, we hope to improve the lives of those served by the Menedékház. Washing-up and toileting facilities may not seem exciting in the grand scheme of things but they are essential and much appreciated among those who are vulnerable or otherwise just getting by. Please do consider how you can support my appeal. I wish you a holy and spiritually fulfilling Lent. As usual, you can give money to this appeal through your church treasurer, who will forward money to the diocesan office.